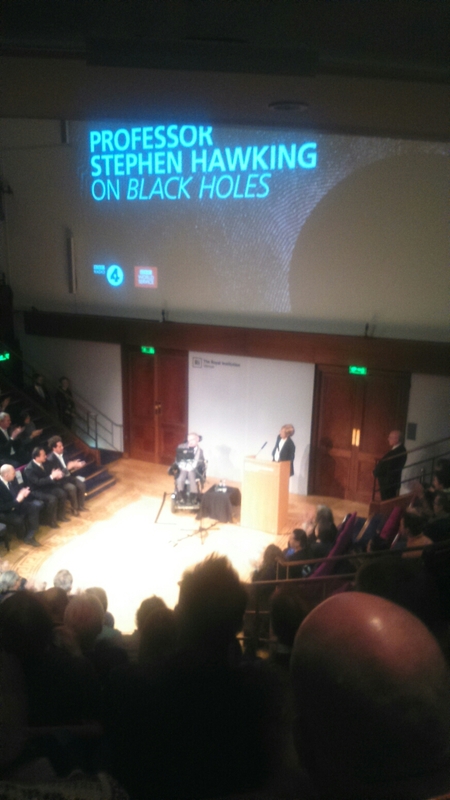 Yesterday I took off early from work to head up to the Royal Institution in London to attend a recording of the Reith Lectures, this year given by Stephen Hawking. Here’s a rather crappy phone pic to show I was there. In fact they recorded two of this year’s lectures, as well as a lengthy question-and-answer session. The talks and answers to audience questions did of course have to be pre-loaded into Stephen’s computer before delivery which necessitated some pauses for uploads. This together with the recording of various intros, outros and idents made for quite a lengthy event but I found the whole process fascinating and didn’t mind that at all. I did have three glasses of wine at the drinks reception before the show, however, so was in quite a relaxed frame of mind generally. In charge of the whole thing was the inestimable Sue Lawley who did her job brilliantly. On a few occasions, Stephen Hawking’s computer had a glitch and made a spontaneous interjection in an inappropriate place. Sue Lawley proved completely unflappable. The topic for the series is, not surprisingly because it is what Hawking is most closely associated with, Black Holes. The lectures were enjoyably sprinkled with some very witty asides, but I did get surprisingly technical at a few points; the audience members beside me were visibly baffled on more than one occasion. See what you think yourself when the lectures are broadcast, the first on 26th January and the second a week later, both at 9pm on BBC Radio 4. They will also be broadcast on the BBC World Service. The Reith Lectures are open to the public. Apparently over 20,000 applied for tickets to attend last night, such is the draw of Stephen Hawking. The capacity of the Royal Institution lecture theatre is only about 400 so many were disappointed. Fortunately for me, owing no doubt to some form of administrative error, I was an invited guest. I was however somewhat relieved to find I was only on the B-list so although I got to use the VIP entrance I didn’t have to sit among the big nobs at the front in reserved seats.